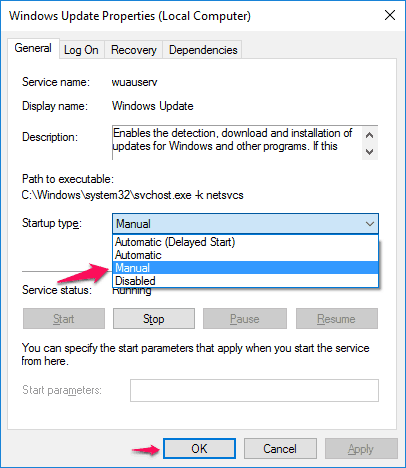 Learn what is windows modules installer worker (TiWorker.exe) and how to fix Windows Modules Installer Worker high disk usage Windows 10 issue? Is your Windows 10 computer lagging down because of Windows Modules Installer Worker high CPU usage and you don’t have any idea about it? If yes then you might be thinking – why is my computer so slow all of a sudden? As we all know, there are plenty of Windows services run in the background of our Windows 10 computer which we are not aware of and Windows modules installer worker (TiWorker.exe) is one of these important services. Basically, Windows modules installer worker is a Windows update service which works to update Windows. But sometimes the process of Windows modules installer worker creates high CPU usage problems and consumes almost 100% of disk space. Before knowing the methods to fix Windows modules installer worker Windows 10 high Disk usage issue, let’s know a little more about what is Windows modules installer worker (TiWorker.exe) and what does it do? What Does Windows Modules Installer Worker Do? As we have already mentioned above, Windows modules installer worker is a Windows update service which is specifically designed to search for new updates and installs it to your computer. This is not a virus or any malware, so you don’t need to worry about your data. This service is responsible for the installation of Windows updates on your computer which means that it performs a pretty important function. So frankly, it is not advised to uninstall Windows modules installer worker Windows 10 as it will also stop the functionality of Windows update but high disk usage by Windows modules installer worker problem needs to be fixed as quick as possible because it makes your computer slower. In case, if you want to check whether your CPU usage has gone out of control because of some issue in the Windows modules installer worker process or not then you can do so by right-clicking on the Windows 10 Taskbar > selecting Task Manager > and then going to Performance tab. And by switching to the Processes tab, you will be able to know which service is causing the high CPU problem. Step (1): First of all, open Run dialog box by pressing Windows + R keys together and enter services.msc then press Enter to open Windows Services. Step (2): On the Services window, you have to search “Windows Module Installer” service. Step (3): Once you have located this service, double-click on it to open Windows Module Installer Properties and under Start Type select Manual option and then click on OK button. You have to repeat the exact same steps for Windows Update service. Search for “Windows Update” service. Double-click on it to open Windows Update Properties and under Start Type select Manual option and then click on OK button. Go to Start Menu > Settings > Network & Internet > Wi-FI > click on the Advanced Options. And then check the “Set as metered connection” option. Once you set the connection as “metered,” Windows 10 won’t automatically download updates on it. Open Run dialog box by pressing Windows + R keys and then enter regedit to open Windows Registry Editor. HKEY_LOCAL_MACHINE > SOFTWARE > Microsoft > Windows NT > CurrentVersion > NetworkList > DefaultMediaCost. Now, right-click on the DefaultMediaCost registry key and then select Permissions option. Click on Add… button located under Group or user names section. Next, type your username into Enter the object names to select section and then click on Check Names button. And then click OK to close Select Users or Groups window. 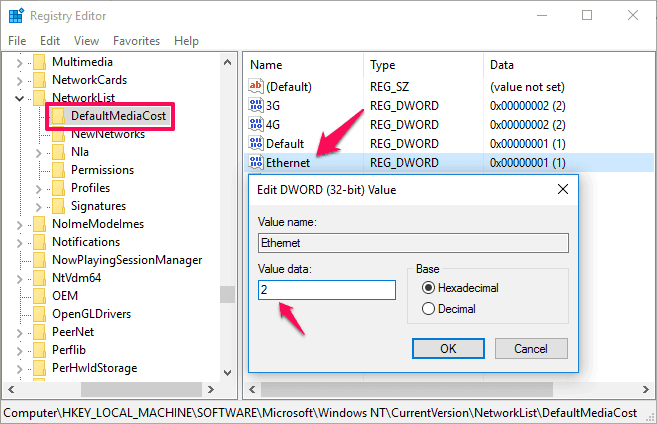 Now from the Permissions for DefaultMediaCost window, select the user you just add and check on Allow box of Full Control then click OK.
On the right pane of registry editor window, double-click on Ethernet and then set its Value data to be 2. Click OK and then close the Registry Editor. Step (6): Finally, Reboot your computer. That’s it! Now your Windows 10 computer will be able to use Windows Update service properly and you won’t experience Windows modules installer worker high CPU usage and high disk usage issue again. It is possible that first method is little difficult for some users as it involves few complex steps. If you also think same then you can use Windows Update Troubleshooter to fix the Windows modules installer worker high CPU usage issue. Windows Update Troubleshooter is a built-in troubleshooter by the Microsoft which helps in resolving the Windows Update errors. First of all, download Windows Update Troubleshooter and install it on your Windows 10 computer. Once you have installed the Windows Update Troubleshooter, it will scan your computer and will look for issues and errors which you are experiencing. Once troubleshooter has scanned your computer, it will also show you the reasons of getting high disk usage by Windows modules installer worker and will also provide you an absolute fix. Once the troubleshooter has fixed the issue, it will show “Troubleshooting has completed”. Now, you can reboot your computer. Windows modules installer worker high CPU usage Windows 10 issue should be resolved. You can also run Windows update service and update your computer with latest updates. Troubleshooting Windows modules installer worker high CPU usage issue is a super easy task if you follow all the steps correctly. We hope that our guide “How to fix Windows modules installer worker high disk usage in Windows 10″ has helped you perfectly in fixing the 100% CPU usage issue. If you have followed any other Windows modules installer worker high disk usage Windows 10 fixes then tell us which one is it and we will add it to this tutorial.